The wily Coyote (Canis latrans incolatus), so deeply rooted in the history and lore of the American West, is a newcomer to the Alaska scene. Coyotes were first noted in the state shortly after the turn of the 20th century. Populations were first reported on the mainland of Southeast Alaska, then slowly expanded northward into the upper Tanana Valley from which they radiated in all directions. A population peak occurred around 1940; since that time numbers have declined in many areas. There are few records of the Coyote north of the Yukon River, although they do occur in this area. Portions of the state with the highest densities of Coyotes are the Kenai Peninsula, the Matanuska-Susitna valleys and the Copper River Valley. The Coyote is best described as an opportunistic feeder. In Alaska snowshoe hares, microtine rodents, and carrion comprise the bulk of the Coyote's diet while marmots, ground squirrels, muskrats, fish, insects, and even Dall sheep are taken in fewer numbers. Occasionally the Coyote finds itself on the other end of the "dinner table." Great horned owls, bald and golden eagles, wolves, and bears all have been known to prey on Coyotes. In some locations, free-ranging dogs will readily kill Coyotes when the opportunity presents itself. Coyotes breed in February and March. A mated pair may stay together through the spring and share parental duties after the pups are born. Other Coyotes, especially young of the previous years, may also help care for the pups. Shortly before whelping, one or more dens are prepared for the litter. Coyotes give birth to an average of five to seven blind and helpless pups. The size of litters varies in response to the food supply. Litters born in times of plenty will, on the average, be larger than those born when food resources are scarce. For the first three weeks the young Coyotes subsist entirely on milk. About this time some solid food regurgitated by the females is introduced into their diet, and the pups are weaned at 5-7 weeks. Once the pups establish a pattern of eating regurgitated food they will induce the parents to regurgitate by biting and clawing at their lips. At the age of 3 - 3.5 months the pups are able to capture food for themselves. Dens are only used for whelping the young and are abandoned during the remainder of the year. When disturbed by man it is not unusual for Coyotes to move the pups to another den. Family units may begin to break up as early as August, although is not unusual for them to remain together into November or even later. The Coyote may be the most vocal of the canids and is sometimes referred to as the "song dog." The most common call is a long, mournful high-pitched howl which ends in a series of sharp yips and yaps. The howl of the Coyote has a somewhat ventriloquistic effect, and it has often been reported that the howling of two or three Coyotes sounds like a dozen or more animals are involved. In the wake of man's relentless expansion into wildlife's domain, few species have been able to coexist and even expand their range as well as the Coyote. The elimination or reduction of wolves from many areas of America, coupled with land and clearing activities, have contributed to this range extension. The major source of the Coyote's conflict with man has been its fondness for sheep and poultry. Though only a few individuals are usually involved in such cases, massive predator control programs using poisons such as 1080 and strychnine, "Coyote getters" loaded with cyanide, traps, aerial shooting, and bounties have been launched against the Coyote. In many states these weapons were very effective, and numbers of Coyotes were greatly reduced. Alaska was not left out of the program. 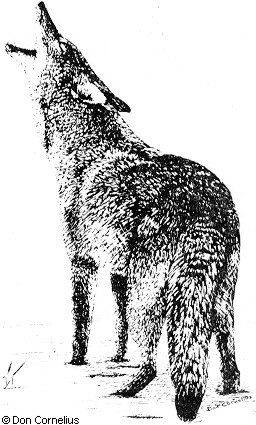 The attitude toward Coyotes was graphically demonstrated in a 1942-43 Annual Report of the Alaska Game Commission in which Coyotes are referred to as "obnoxious animals." Today, attitudes about Coyotes have changed radically. Bounties were removed in 1969 and the policy, as in other states, is one of control rather than extermination. Today, a small number of Coyotes are trapped each year, providing some income to Alaska trappers. In addition, a few are shot by hunters in pursuit of other species. A few individuals hunt Coyotes by predator calling. The predator call simulates the cry of an injured rabbit and is probably the only effective way of hunting Coyotes in Alaska. The secretive nature of the Coyote makes it an animal which is seldom seen by most Alaskans. It is for this reason that those rare sightings of a Coyote take on a special significance. It appears that this newcomer to the Alaskan scene, the "song dog of the West," has found a niche in our state.